- Pith, located in a cavity, or medullar channel if there is one, in the centre of the stem. It is composed of thin, parenchymatic cells. The cells very often contain clusters of crystals, while there are also mucilaginous cells. It has an extremely low specific weight and a very high capacity for absorbing liquids. The xylem, the woody portion of the stem, is a hollow cylinder whose cross-section decreases from the bottom upwards. Its percentage varies in relation to the other components of the stem according to the species. When the plant is mature it may vary from 50% to over 75% of the weight of the stem. Its thickness varies significantly from the base - where it is particularly wide and well-developed - towards the apex, where it thins down to become herbaceous. 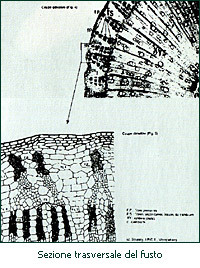 From a histological point of view, xylem is normally composed of short fibres, relatively broad and well lignified, arranged in the direction of the stem to form a continuous cylinder crossed by the wood rays.